The sun beats down upon you in this Mummy's Mask adventure! Crossing the Dunes of Death, you are beset by maftets, leonine creatures who worship Areshkegal, the mistress of riddles. Your pursuit of the Forgotten Pharaoh grows ever more dire. 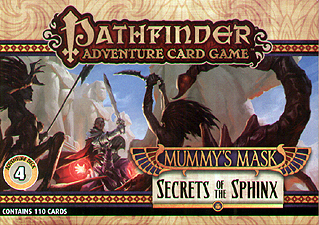 The Pathfinder Adventure Card Game: Secrets of the Sphinx Adventure Deck is a 110 card expansion that adds 5 new scenarios to the Pathfinder Adventure Card Game, and also includes new location, villains, monsters, scourges, traders, loot, and more. This deck requires the Pathfinder Adventure Card Game: Mummy's Mask Base Set, the Empty Graves Adventure Deck, and the Shifting Sands Adventure Deck.